Halloween is almost here! Halloween is one of the most fun nights of the year and since night animals are frequently featured in Halloween stories, it’s a great time to teach kids about the nocturnal animals that come out at night! 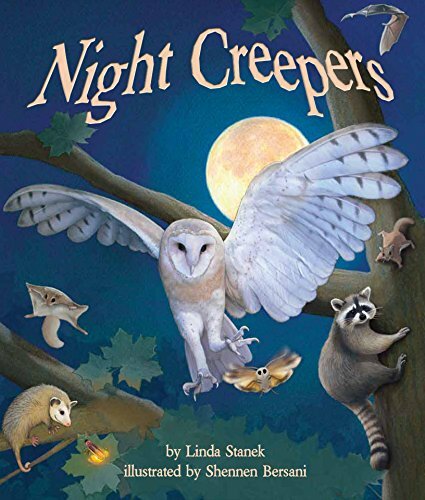 In Night Creepers picture book, children learn all about nocturnal animals and their behaviors. With lots of awesome illustrations, it is a great STEM story for bedtime. Some of the animals featured in Night Creepers include the flying squirrel, the red fox, skunks, fireflies and more. The flying squirrel does not actually fly, but glides with its parachute-like arms. Bats eat mostly insects but also fruit and some small animals. White-tailed deer that are mothers, are called does; they leave their babies, called fawns alone sleeping during the day to keep them safe from predators. Owls don’t have eye muscles, which is why they have to look around with their heads. They have both excellent night vision and great hearing. At the end of the book is more information about the night habits of the animals featured in the book, along with educational sorting and matching activities. If you know a child who loves animals, especially the mysterious kinds of animals, Night Creepers is the perfect book to introduce them to the world of nocturnal animals. Find more information on nature and wildlife for kids here; for more books on STEM (science, technology, engineering and mathmatics) subjects, visit http://calicokidz.com/category/stem. This entry was posted in animals, bedtime, conservation, nature, STEM, Uncategorized and tagged animal habitats, animals, book review, crepuscular animals, diurnal, environment, environmental, eyeshine, light shine, Linda Stanek, night adaptations, nocturnal animals, picture book, science for kids, STEM picture books. Bookmark the permalink.